Pebbled leather handbag with a detachable adjustable shoulder strap, three interior pockets, and a studded base. this bag is fantastic! I watched loads of reviews on YouTube and all of the owners are very happy with the bag. I guess this bag was executed differently in the past with chain links, currently as of Febuary 2015; this bag has a plain long crossbody strap with no chain links and does not have a 'secret zipper compartment.' Shipping is no joke. I ordered on Sunday feb 1st and received my bag on Tuesday Feb 3rd. My bag had a crease across it's silhouette most likely because of how it is stored before shipping. it's now been a week, been using it daily, and the crease eventually went away. Some reviews would say that this is slightly structured but this bag definitely sags as if it was real leather. It doesn't seem like obvious faux leather either. The gold hardware on the bottom of the bag doesnt seem like steel because it is pretty light and can easily be moved to the touch. The D ring where the strap can be attached along with the hardware on the shoulder strap seems like a rose gold color compared to the studs on the bottom. The zippers are generic but zips smoothly. There is no 'secret' side zip compartment. The inside is cotton lining. One mobile pocket, a multifunctional pocket, and a zip compartment. I am petite 5'2 and it is definitely a great size to my body type. It's not too bulky. My friend is 6' tall and even he looks good with the bag. I'm a guy as well! :) It is not heavy at all. I know the Rocco is a heavy bag because of the studs on the bottom is metal. I mentioned the studs on this bag are lighter and the faux leather itself is not heavy. In the stock photo, the handles seem to be tall. I was afraid of having to deal with long handles but it's not. Also, since this material sags, it's not bothersome. I am definitely going to do a thorough review on YouTube/iCKEST sometime soon. The only issue I have with my bag is that, there is a seam inside the bag where the thread seemed to loosen up and unravel that the material behind the cotton lining became exposed. It's not a major deal breaker for me since this bag is not expensive and I don't plan on using it all the time. Overall, I am very very happy with this purchase and love the overall look. If you are looking into this bag, I definitely recommend! It's a great look for less item. I LOVE this bag!!! I first saw this bag on nikkiphilippi's instagram, and fell in love with it!! I love the Alexander Wang bag that looks like this, but having a almost $900 price tag attached to it, I wanted something that was cheaper. At only approximately $50, I would totally reccommend this bag. First off, the feel of the bag feels really nice, alot more than I would have first thought, and, bonus, it has a secret pocket on the side! It comes with two shoulder straps, one, which is pictured, and the other is a standard adjustable strap. The bag is actually a bit bigger than what I would have thought, so if you're looking at the picture and thinking it might be a bit small - think again because it is quite a nice size, and I can fit quite alot of things in it. I got this bag in the mail about 3 weeks ago, and I have not stopped using it since. Most definitely my favorite bag of all time, and I have gotten a lot of compliments on it as well; I LOVE it!! I've been in love with this bag!!! It fits everything I need and I love the option of been able to throw it across my body. ?????????????? I just received this bag yesterday and I can't stop looking at it, it looks so similar to the Alexander Wang Rocco. I absolutely love it!!! It makes all my other handbags look sad and dull. It is not real leather but it looks like it, its soft and nicely textured. I did take away the strap with the chain since I thought it took attention away from the studs at the bottom but it does come with another long black strap that you can use to carry it cross body which is perfect. The bag also looks very sturdy and well made so it should last me a long time. If you are thinking about getting this just do it! It is simply a perfect bag. 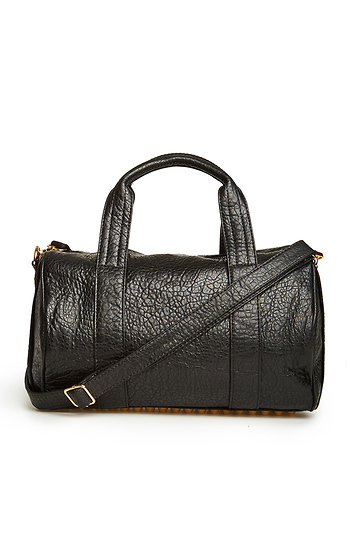 I really like this bag, because it is very much like the Alexander Wang "Rocky," but at a fraction of the cost. I will definitely say that it is way smaller than what it appears in the picture! It is pretty spacious though, which is something I like. One thing that I'm really disappointed about is that I thought that the strap was detachable, unfortunately not. I will have to take it off with some pliers. I've been in love with this bag since I received it. I use as my everyday purse. It carries alot , I can even fit in my huge camelbak water bottle in it if i have to. I try not to carry too much because it will tend to get heavy. The only issue I have with the bag is that when I first unboxed it, I found out that one of the studs was slightly loose. And after a couple of uses I noticed that more of the studs could easily be moved. I have been looking for a bag like this for sooo long! It is so pretty and works with every outfit! I chose this bag since it looks like the Alexander Wang bag and I love it! It looks very chic with casual and dressy outfits. Simple and very spacious! I definitely recommend it! Shipping was quick as well! This bag is very nice quality, and they have gotten rid of the strap I noticed everyone was mentioning. One thing I did notice was it doesn't have the hidden side pocket, like the actual rocco bag, but this is just an inspired bag so for me it doesn't matter. I love this bag and so happy with all of the products I have purchased from dailylook.com. Great customer service. Great Quality.